Stress fractures are a type of overuse injury. Spastic Cerebral Palsy (CP) has caused my muscles to be very tight and I move differently as a result of it. Different parts of my body such as my hands, shoulders, back, and feet take on repetitive excessive pressure and force as I move, work, and exercise. Now, ten months after my injury, I am still in the process of recovering from the impact of the broken bones. My muscles weakened from having my right leg immobilized in a cast for eight weeks. I still have trouble lifting my right foot up. My foot catches on stairs that are six inches high. I had to let go of goals that I have been working on for over 9 years to master. My efforts to walk without devices full-time was actually increasing my risk of injury and contributing to the potential of stress fractures caused by excessive force and ‘pounding’ from the way I move. Doctors and specialists advised that I stop efforts to walk device-free. While I needed to accept and implement the guidance I was given, I am still in a process of acceptance. Every time my foot fails to clear a six inch stair, I become exasperated. The front part of my foot lands where it is supposed to and yet the heel of my foot fails to land flat on the new surface. Beyond the frustration of not being able to perform a task physically, I also had to set aside desires that were born from my efforts to walk without devices. For example, I wanted the freedom to carry an umbrella when it rained. I had thoughts that I could learn skills to keep myself steady enough and stable enough to carry an umbrella, a book, or a coffee cup while I walked. 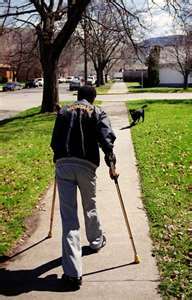 I have always used canes, crutches, or mobility aids. Some might ask “Has Kerry really lost anything?” Hearing the words from Doctors and specialists that I would have to modify and stop efforts and goals that I had put my heart and years of effort into represented a significant loss—being able to carry an umbrella, a book, or coffee cup while I walked had become important goals. I am still mobile and I am doing what I need to do to recover. At the same time, when I broke the bones, the goals I worked so hard for had to change or stop. The anticipated achievement of walking device-free had to change. I grieved a loss of a potential that had become such an integral part of my life. Until now, I could not put my feelings into words for NCHPAD readers. In my case, the physical part was dealing with being put in a cast and losing the range of mobility that I was used to. Emotionally, I was angry, frustrated, and also anxious about the future. I had many questions such as “Would I fully recover?” “Would I get the ability back to walk an average of 3 miles a day like I was accustomed?” No one had an answer to these questions. Time was going to determine the answer. After the bones healed, I dealt with the frustration of not having the function and skills I was used to and had worked so hard to build. I wanted to lift my foot up and not trip. I wanted to lift my foot up with ease. I wanted the physical strength that I had before the injury. What I failed to realize at the time, and am still in the process of recognizing and accepting, is that when the bones broke a new starting point – a new baseline — was established. I needed to adjust my standards and criteria of function and begin again. The strength, ability, and skills to move better would take me time to re-build. My ten months of silence was a time to re-evaluate and to re-establish goals based on a new baseline. I continue to work with professionals twice a week. I am working with these professionals to regain the strength and skills I need in order to lift my foot and walk better. I will write future articles about the new baseline and approaches I am using to improve my mobility. In writing this piece I hope to bring more attention to the emotional elements of injury. My injury was not just about the physical broken bones. I felt the emotional outcomes of anger, frustration, and most of all, having to accept changes that I did not want. My new reality did not match the picture and goals that I had held for so long before the broken bones. Injury is not just physical. Tell me NCHPAD readers; have you experienced the physical and emotional impacts of an injury? How did you establish a new baseline? How did you recover and make a fresh start after an injury? Kerry, what an incredible journey you are on. Continued success in all your endeavors. Keep up the good work.